Low Temperature Co-fired Ceramic packages that are ideal for the high-speed wireless data communications, security, and Hi Rel Applicatoins. 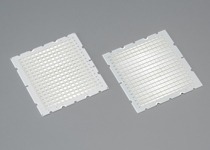 Embedded or surface printed passives with low resistance conductors are possible in multi-layer or mono-layer structure. Low profile, low electrical loss devices built using NTK's LTCC technology. Variable coupling frequency selections for wireless applications.